Ancient Romans believed 'Inter arma silent Musae': among arms, the Muses fall silent. This is not necessarily true. 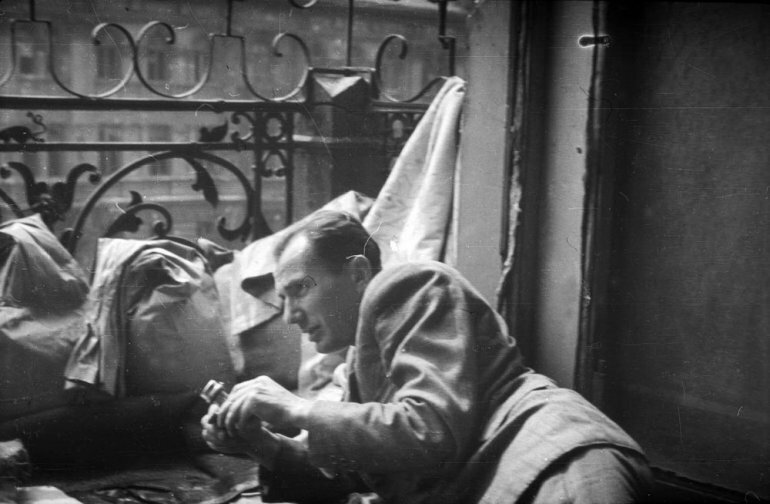 During the Warsaw Uprising, artists massively participated in battle, and not only the armed one. When the Warsaw Uprising broke out, the young generation was faced with a choice: the pen or the rifle, the brush or the grenade. The choice was clear. A sensitivity with respect to the insurrectionary tradition was decisive. Young artists felt that they were first and foremost soldiers of the Home Army. Only a few escaped death, the best ones perished. It was with these people in mind that Professor Stanisław Pigoń spoke these memorable words: Well, we are part of a nation whose fate is to shoot at the enemy with diamonds. The survivors took up the incredible toil of continuing cultural activity in the city of Warsaw during the uprising. It is hard to believe, indeed, that dozens of poems and songs were written during the uprising, that more than 50 revue shows were organised, that there were several puppet-theatre performances for children, countless concerts performed by musicians and composers, hundreds of radio shows broadcast by Polish Radio and the Błyskawica radio channel of the Home Army, some 150 press titles were released, numerous colour posters were designed and printed, as well as a series of postage stamps, eagles and other emblems. 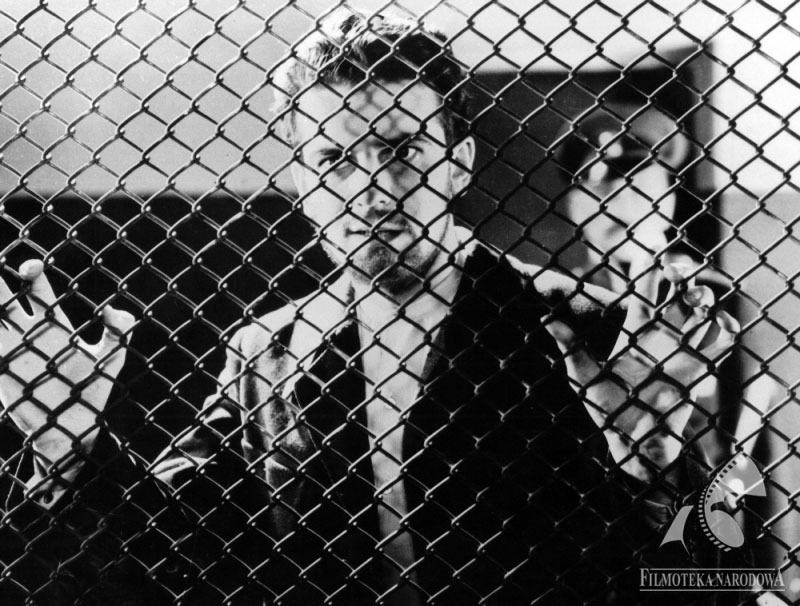 Hundreds of drawings and portraits were also made and 15 metres of film tape were shot as well. The number of photographs taken during the uprising, which exceeds tens of thousands, also deserves special attention. Legends of these dramatic times evoke the names of poets who died with weapons in their hands. Krzysztof Kamil Baczyński, codename 'Krzysztof', died on 4th August 1944 in the Blanka Palace. Tadeusz Gajcy codename 'Karol Topornicki' and 'Roman Oścień' died together with corporal office cadet Zdzisław Stroiński codename 'Marek Chmura' on 13th August in the house at 3 Przejazd Street. In the poem Ród Anhellich (editor’s translation: Anhelli’s Descendants) Stroiński called them the 'Polish pilgrims to horrific tomorrows'. They were the ones deprived of the chance to write any new verses. Yet, many new verses were nonetheless composed during the time of fighting. Poems, songs, concerts, photographs and films. In his book The Muses of Those Days, graphic designer and journalist Stanisław Kopf (codename 'Malarz' [literally, 'Painter']), an active participant of the Warsaw Uprising, commemorated those for whom fighting the enemy was equalled with the possibility of free artistic expression. From the first shooting in the city, propaganda-soldiers: press reporters, photographers, cinematographers, megaphone patrols, news-mongers and aid-instructors are all working and fighting. I call on all soldiers to help them in their task, as we remember that their work alleviates bearing the difficulties of war, it makes us more immune […] to psychic shock, and makes it possible for those in command to render political the Home Army soldier’s struggle. Let us recall some of the accomplishments of the writers and artists who worked under the sign of the 'PW' anchor – the symbol of Polska Walcząca, namely Fighting Poland. Krystyna Krahelska (codename 'Danuta'), was born on 24th March 1914 in Mazurki in Baranowice County. The daughter of Jan, a governor of the Polesie province and Janina, née Bury. She obtained her baccalaureate from the Romuald Traugutt School in Brześć by the River Bug. From 1929, she was a member of the Polish scouting movement in Polesie. Krahelska performed in the Polish Radio in Vilnius and in Warsaw, where she also completed her Ethnography degree. In 1936-1937, she was the model for the sculpture of the Mermaid of Warsaw, created by Ludwika Nitschowa. Hey, boys, bayonet on a rifle! Grenades in our hands and bayonet on a rifle. In a rhythmical march: one! two! three! Grenades in our hands, and bayonet on a rifle. The Young Victorious Poland is within and in front of us. In rhythmical march: one! two! three! Grenades in our hands and bayonet on a rifle! 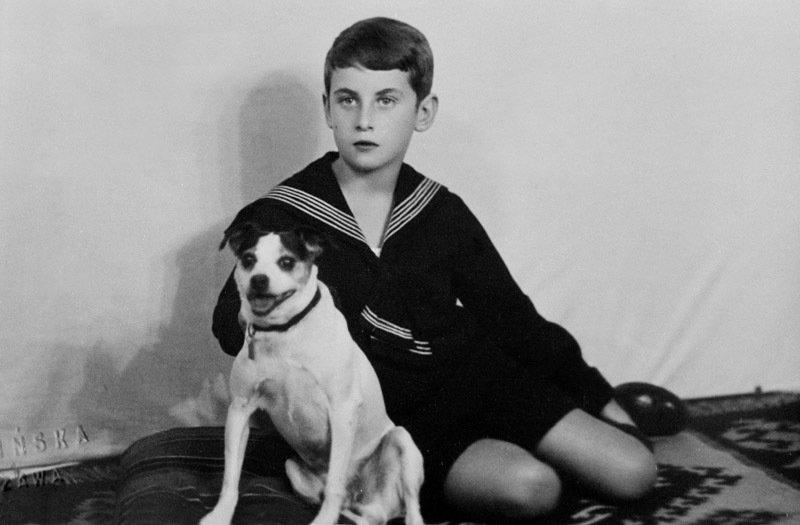 Jan Ekier (codename 'Janosik') was born on 29th August 1913 in Kraków. He studied at Jagiellonian University. 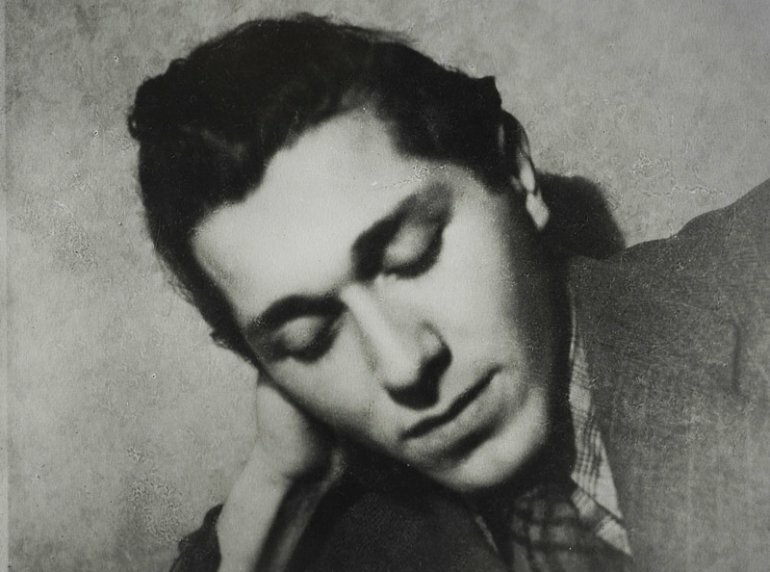 In 1937, he came 7th in the International Frederick Chopin Piano Competition in Warsaw. He was the author of numerous partisan songs, including the popular Szturmówka. He performed dozens of concerts for those fighting, as well as those injured in the Warsaw Uprising. He played in the concert halls of the Warsaw Conservatory in the Powiśle district, as well as the auditorium of the Architecture Department of the Warsaw University of Technology. Rain and muck – ain’t it nice. Even if the devil himself! There’s no obstacle, and no bad road. And we salute you, and may God guide us! and executions and the camps. Our courage will meet its luck. That same day, Kornel Makuszyński, also made his appeal with the verses of Śpiew Czerniakowa (The Singing in Czerniaków). To arms! Our day, too, it has come! On our riverbank of the Vistula! The list of the authors whose songs and melodies became part of the Uprising cannon is long. Apart from the aforementioned two there were also: Jerzy Dargiel (codename 'Henryk', 'Juda'), Zbigniew Jasiński (codename 'Rudy', 'Rawicz'), ensign Mirosław Jezierski (codename 'Karnisz'), Aleksander Kamiński (codename 'Hubert', 'Kamyk'), Stanisław Marczak-Oborski, Jan Markowski (codename 'Krzysztof'), ensign Józef Andrzej Szczepański (codename 'Ziutek'), and Irma Zembrzuska. The people of letters worked for the Błyskawica and Burza radio stations, which sometimes lended their apparatus to the Polish Radio team. Among those who worked for the radio there was Aleksander Maliszewski (codename 'Piotrowski'), Mieczysław Ubysz (codename 'Wilk'), cadet Jan Nowak-Jeziorański (codename 'Zych'), and Edmund Osmańczyk. Jeremi Przybora was also guest speaker. A special radio programme was created and directed for the Soldier’s Day on August 15th by Leon Schiller. 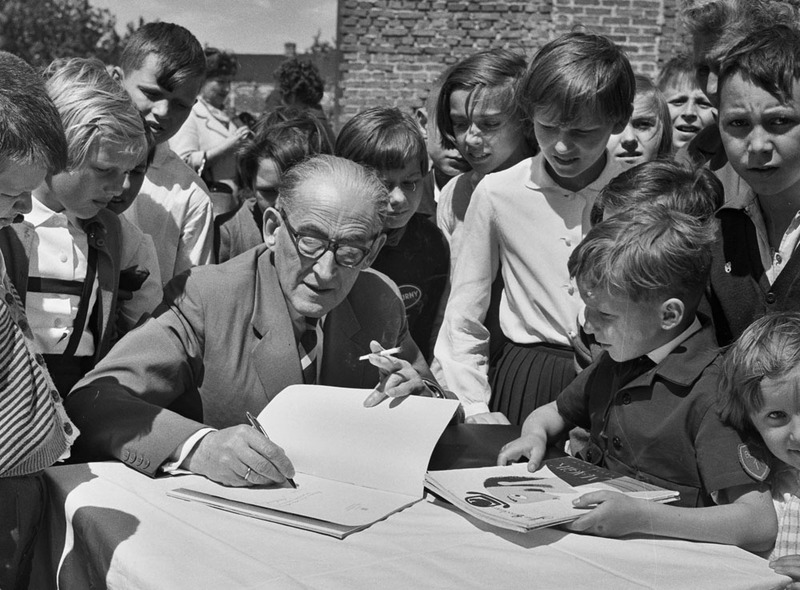 Mieczysław Fogg – whoever had an audience like that? 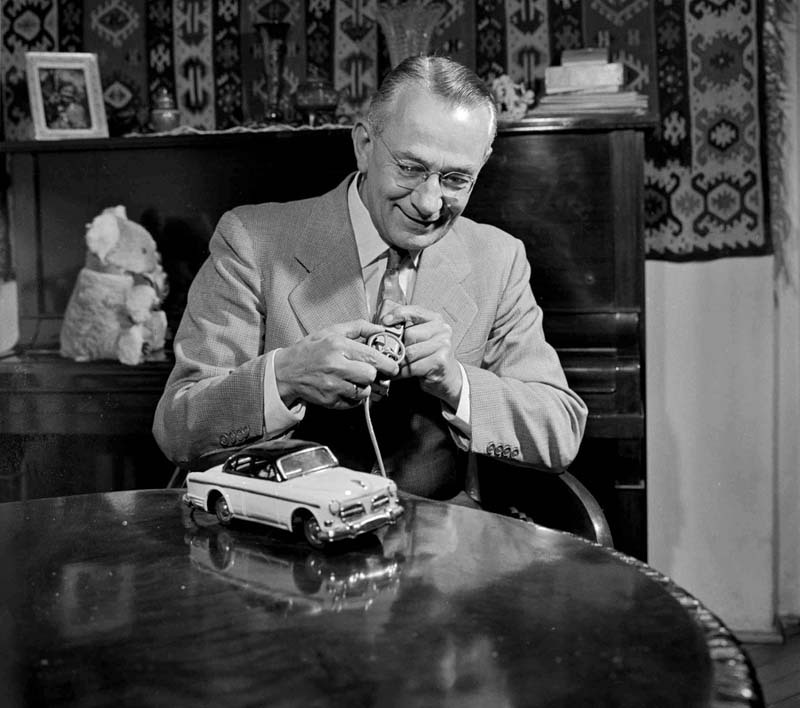 Mieczysław Fogg, born on 30th May 1901 in Warsaw, died in Warsaw on 3rd September 1990. He was one of the most popular singers during the uprising, giving concerts for both soldiers and civilians. After the war, he performed an array of songs which were known across all of Poland and also abroad, in the milieux of emigrant Poles on all continents. I once participated in an official concert for the Day of the Soldier, which took place in the auditorium of the Architecture department, accompanied by the clamour of machine gun shots in the streets. The room was filled with boys and girls. The young carried guns and atomisers, they had grenades hanging from their belts. [I wonder] how many singers in the world have had an audience like that? As it is noted in the archives of the Home Army Information and Propaganda Offices, the singer performed 104 shows during the time of the uprising, which included concerts in shelters, field hospitals, and on the barricades, and during which he was wounded on more than one occasion. Mieczysław Fogg has been granted the Cross of Valor medal, and he was the fourth Pole to receive the Golden Cross of Merit with Swords, awarded by the London Government. Fogg’s arm band from the uprising is exhibited in the Museum of the Warsaw Uprising. One of the strongest experiences I had during the Uprising is connected to performing the famous March of Mokotów, composed for me by Jan Markowski, a friend and someone who often accompanied me during the nazi occupation, […] with lyrics by the Home Army officer Mirosław Jezierski. […] The song was inspired by fighting in the Mokotów district, it was written on stained note paper with a simple pencil, and sent to my apartment on Koszykowa street through the underground sewage canals. I learned the new song rather quickly, in less than three days. Its pertinence gripped the heart. One had to learn quickly, anyway, in order to still have the time to sing. After all, death was taking its bountiful toll all around us. 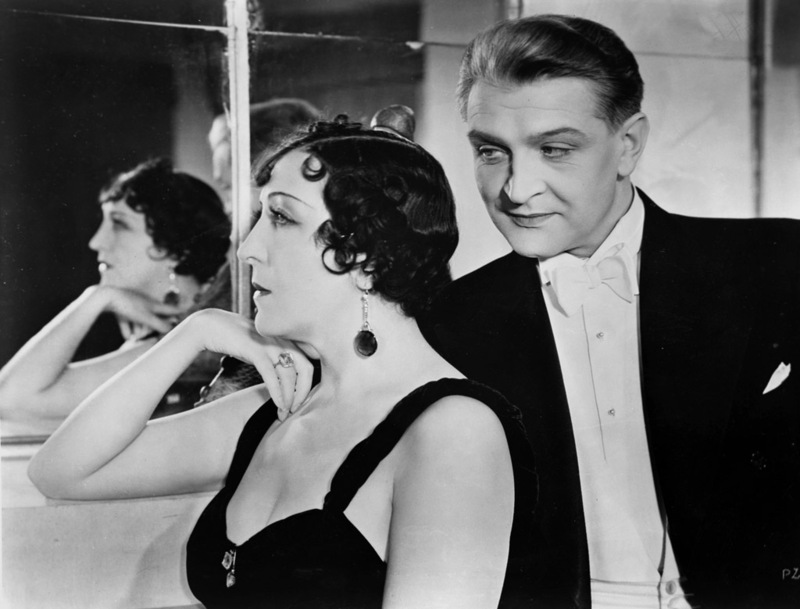 Many artists of the Polish stages and the silver screen were to be found among the fighters of the Uprising. Tadeusz Fijewski fought in the 'Konrad' squad, and was engaged in the most active theatre group of the time, lead by Leon Schiller. 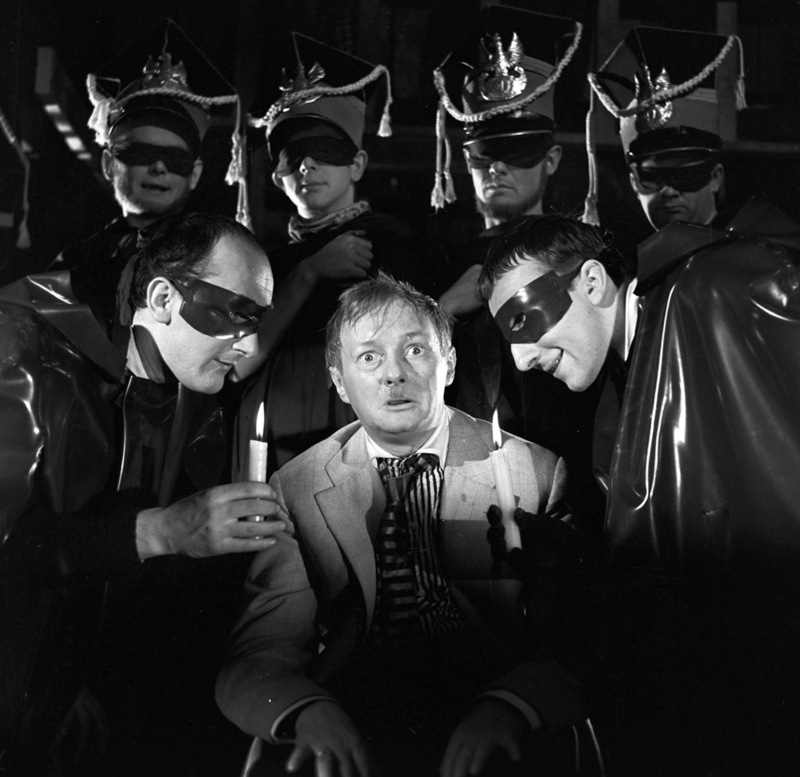 On August 15th, 1944, he was part of the theatre troupe performing the Kantata na otwarcie Teatru Narodowego (Cantata for the Opening of the National Theatre), written and directed by Schiller. The performance was interrupted by bombing and the destruction of the U Aktorek cafe, where it was staged. Adam Brodzisz (codename 'Bonzo'), a famous actor before the war, was an officer of the 'Baszta' sapper regiment company. His wife Maria Bogda, also an actress, was a nurse in that same company. Maria Gorczyńska, another star of the silver screen, was a liaison for the Women’s Army Service. Dancer Alina Janowska (codename 'Alina'), who was a sworn liaison of the 8th company battalion 'Kiliński', began her acting career right after the war. The artists who were subject to the Department of Propaganda of the Main Headquarters of the Home Army, as well as those mobilised into service after the outbreak of the Uprising worked under the supervision of Bronisław Rutkowski (codename 'Korycki'), Tadeusz Ochlewski (codename 'Ochlik') and Józef Wyszomirski (codename 'Albin'). An account from 22nd August 1944 states that a total of thirty five concerts for soldiers had been organised to date, half of which were prepared by the employees of the Bureau of Information and Propaganda, while the other half was called on spontaneously. A list of some of those artists who performed during the uprising includes some of the following names: Halina Balińska, Halina Bielska-Poreda, Tadeusz Bocheński, Wiesław Brodziński, Hanka Brzezińska, Jaga Dąbrowska, Irena Dubiska, Jan Ekier (codename 'Janosik'), Mieczysław Fogg, Irena Gadejska, Julia Gorzechowska, Stanisław Jaśkiewicz, Stanisław Kazuro, Władysław Kędra, Barbara Kostrzewska, Zbigniew Krukowski, Joanna Krysińska, Maria Kulej, Irena Kwiatkowska (codename 'Basia'), Zygmunt Latoszewski, Aleksander Lewandowski, Karolina Lubieńska, Jola Madeyska, Ewa Porajska, Janina Romanówna, Leon Schiller, Danuta Szaflarska (codename 'Młynarzówna'), Zbigniew Turski, Halina Zahorska, Mira Zimińska and Olga Żeromska. On the third day of the uprising, I had to leave the house on nr. 8 Focha street. I took with me: a blanket, a fur coat, a roll of musical score, a bottle of Chanel 5… and I walked through the underground cellars to the Old Town. Together with my colleagues: Józef Orwid, Józef Kempa and with the son of Basia Halmirska, we arrived at the shelter on nr. 1 Kilińskiego street […] On August 6th, a officer of the 'Wigry' scouting battalion came to us, with the proposition of organising some concerts. We agreed with great enthusiasm. […] I think about a dozen concerts took place, all the way through to the memorable August 13th. On that day our people took over a tank and they came with it to Kilińskiego. Nobody suspected that it was a trap, that the tank was filled with explosive material. […] I was standing near the tank with Józef Orwid. I decided to walk away for a moment, to get a drink of water, when I climbed up the stairs I heard that horrible explosion. […] I lost consciousness for a while. When I picked myself up and ran out into the street, I saw something which is difficult to imagine. Hundreds of torn bodies, human scraps hanging from balconies. […] Józef Kempa, the son of Basia Halmirska and Józef Orwid, who was waiting for me by the tank - all died. From that day on I stopped singing. From one day to the next, the Old Town was transformed into a sea of ruin and fire. I helped to tend to the wounded. I consoled them as much as I could, especially those who had no chance of survival. It’s strange, but the bottle of my favourite Chanel 5 helped me in this. In the suffocating air of the cellars, in the stink of pus-covered sheets, I dripped perfume on my wounded ones. They stopped me, saying 'Ms. Hania, please come around once more, it’s such a beautiful scent…’ When on September 1st I was walking away into the canals with the army, one of my colleagues pointed to the walls of the neighbouring house. 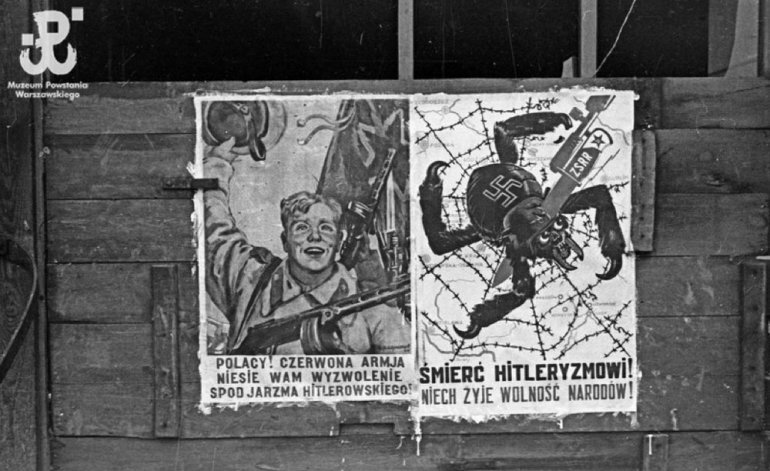 Scraps of posters still remained on it, and an inscription in pencil 'Hanka Brzezińska is singing in the Ministry of Justice’. The actor Franciszek Brodniewicz also died in the uprising, as well as the brutally murdered Mariusz Maszyński, the film director Mieczysław Krawicz, and the film director and producer Stanisław Szebego. In the gate across the street, a concierge appears with a white-red flag on a stick. The canvas is terribly creased. 'I kept it in the cellar for five years!' he yells across the entire neighbourhood. His cry is applauded. He triumphantly puts up the flag above the gate. A need for national symbols was commonly felt in society. The Home Army’s Bureau of Information and Propaganda soon set up its own art studios. Graphic designers, painters and interior designers devised emblems of the state, warning signs, information displays and even elements of the army uniform. One of the studios created an official poster with the white eagle on the red background, and the slogan 'Long live the Government of the Republic – Glory to the brave Home Army – 1 VIII 1944'. From the first hours of the uprising, a group of visual artists was active in the Propaganda Department of the Home Army’s Main Headquarters. They were mostly people engaged in conspiracy, or solider artists who had been cut away from their troops. The Graphic Section was directed by Mieczysław Jurgielewicz (codename 'Narbutt') together with his co-director, Stanisław Tomaszewski (codename 'Miedza'). Some members of the team included: Leon Michalski, Henryk Chmielewski (codename 'Jupiter'), Stanisław Fiszer, Jan Marcin Szancer, Aleksander Sołtan, Zofia Siemaszko and Jan Chrzan. Many artists also engaged in active military combat in various districts of Warsaw. 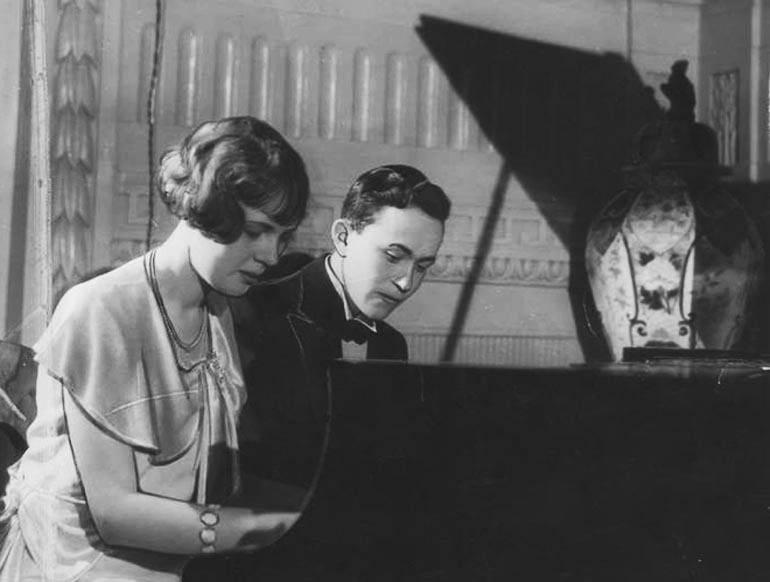 The uprising troops comprised young people whose talent developed and shone after the war: Anna Bąkowska, Krystyna Biedrzycka, Tadeusz Bogdański, Janusz Grabiański, Andrzej Heidrich, Andrzej Kowalewski, Tadeusz Kubalski, Juliusz Kulesza, Barbara Massalska, Jerzy Miller, Wiesław Nowak, Marian Stachurski, Roman Terlikowski, Maciej Urbaniec and Lech Zahorski. The Army Graphic Studios created colourful posters, illustrated pamphlets, the emblems of the state, various illustrations and postage stamps. Around 13,000 copies of these stamps were printed in an array of various colours (designed by Stanisław Tomaszewski (codename 'Miedza') and Marian Sigmunt). Printing studios functioned in different city districts during the whole period of the uprising, changing their locations and their staff. More than 140,000 press titles of different political options were printed during the two months of the uprising. Walls and fences were decorated with colourful posters, drawings, announcements, pamphlets and lists of missing people. The state emblem was restored to post boxes. People gathered around such locations, curious to learn about any information from the uprising authorities. 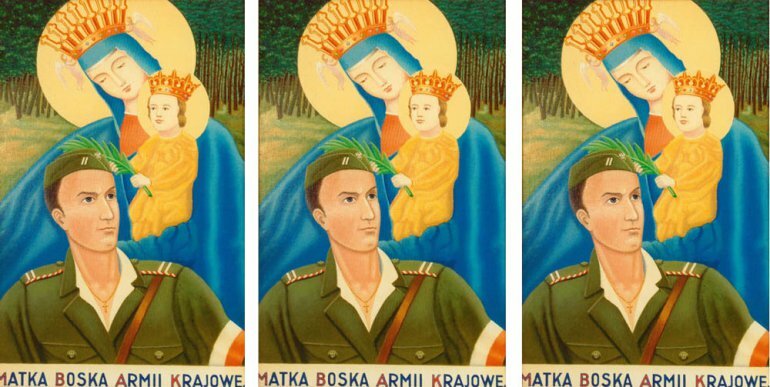 In August 1944, while Irena Pokrzywnicka was painting the Holy Mary of the Home Army, a mine thrower tore down the ceiling of the studio in Warsaw, and wounded her. The painting was retrieved from under the rubble, and after its completion, it was displayed on field altars. In the ruins of her former studio, the artist also made thousands of copies of the painting, which were given out to soldiers. Irena Pokrzywnicka was awarded the Silver Cross of Merit with Swords. Various artists attempted to portray scenes of combat, to commemorate the experiences of both soldiers and civilians, and to portray their friends. My uprising 'creativity’ began with the first days of August, when one of my colleagues found out that I was drawing. After that I was asked for a little souvenir-caricature portrait on every possible occasion. […] Once, during the patrol of the slope in the Zamoyski Garden, the head of the commander of the institution handed me a strange album and requested: 'I will note the most significant events in it, and you will draw the portraits of some of our colleagues. If I will die, then maybe someone will keep the diary. […]' The owner of the diary survived the uprising, and the album, bearing a collection of more than forty drawings, was found after thirty years. Photojournalists and cinematographers of the fighting Warsaw performed a huge task in their efforts to document images of the Warsaw Uprising. Thanks to them, one of the biggest armed battles of World War II is also one of the best documented ones. During W-hour, film crews and Photographic War Reporters’ patrols set out into the streets of the city together with the assault troops. Members of the film crew included: the director Antoni Bohdziewicz (codename 'Wiktor'), who was the head of the group, the cinematographers’ supervisor Jerzy Zarzycki (codename 'Pik'), the cinematographers Stefan Bagiński (codename 'Stefan') and Seweryn Kruszyński, the brothers Edward and Ryszard Szope, Henryk Vlasak and Antoni Wawrzyniak. Later they were joined by Andrzej Ancuta (codename 'Kier'), Stanisław Bala (codename 'Giza'), Jerzy Gabryelski and Kazimierz Pyszkowski. The cinematographer Roman Banach (codename 'Świerk') was active during the entire period of the fighting in the Mokotów district. The filmmakers’ operating base was located in a small cafe at 8 Szpitalna Street. The rooms of the FIP, a German film company on Leszczyńska Street in the Powiśle district, were used as the lab and editing studio. Photographic reporters had their base in the former German photographic company’s headquarters at 8 Mazowiecka Street. The team was headed by Wacław Żdżarski (codename 'Kozłowski'). The largest number of reporters with FSW band on their arms fought in Śródmieście. Sylwester Braun (codename 'Kris'), Eugeniusz Haneman, the Bal siblings: Halina (codename 'Małgorzata') and Stanisław (codename 'Giza'), Leszek Rueger and Joachim Joachimczyk (codename 'Joachim'), Marian Grabski (codename 'Wyrwa') all worked there. Towards the end of the uprising, a growing number of soldiers shot amateur film footage. They usually documented events from the very first front lines. Some real talents were to be found among them: Eugeniusz Lokajski (codename 'Brok'), Wiesław Chrzanowski (codename 'Wiesław'), Lech Gąszewski (codename 'Orion'), Stefan Bałuk (codename 'Kubuś'), Zbigniew Brym, Stanisław Sommer (codename 'Makina') and many others. Their photographs had a very dynamic framing and they were the living proof of personal courage and incredible skill of handling both the camera and the machine gun. I positioned myself on the roof of the house on 28 Kopernika Street. The weather was beautiful, the morning sun pure, the panorama of a wounded Warsaw stretched out in front of me. […] Time passes. I checked on my Leica once more: f/8, 1/200 sec., distance: infinity. 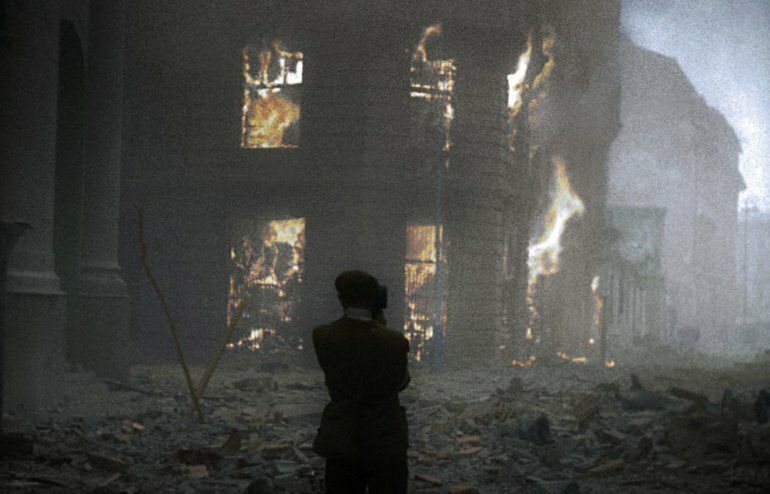 […] I spent one hour waiting when my eye caught the yellow stream of smoke from a bullet painted against the blue sky. I saw how the Prudential was hit and how the explosion blossomed through the camera’s viewfinder. In three seconds, I took six photographs. I was leaning hard against the chimney, because the blow rocked me rather strongly. The account comes from Grzegorz Jasiński’s Powstanie Warszawskie: Najważniejsze Fotografie (The Warsaw Uprising: The Most Important Photographs), released by RM Publishing, Warsaw 2014. The Wedel house at 8 Szpitalna Street housed a renowned Polish writer, Maria Rodziewiczówna. After the ceasefire, soldiers of the 'Krybar' helped to take care of her. The insurgents assisted the elderly writer as she moved out of the house. Before leaving the capital, Rodziewiczówna wrote a few lines in the insurgent diaries. 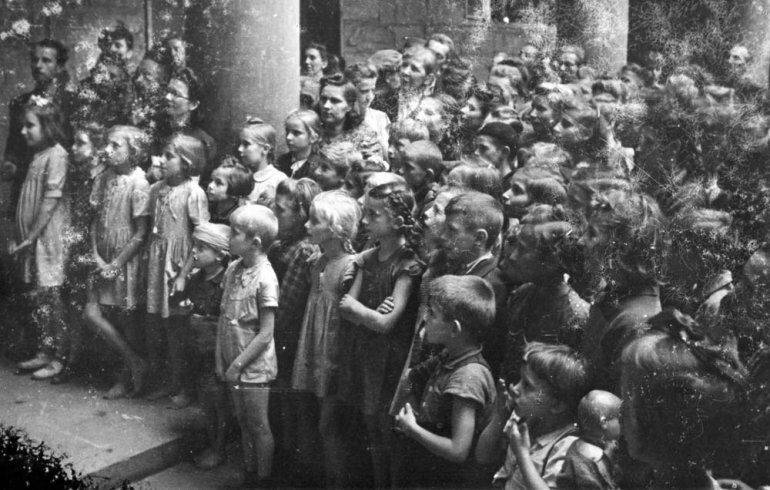 She went through a resettlement camp in Pruszków. She spent her last days in Żelazna near Skierniewice. She died on 6th November 1944. Silence suddenly fell among all these burdening worries, among the constant thunders of explosion, among the howling of the 'cows' [bullets from German flamethrowers] and the roar of air engines. This sudden leap, this great contrast made me very anxious. Something bad had happened. Something very bad. It was certain. I remember 1863. Back then, there was also a moment of sudden silence. Everybody spoke in a lowered voice and even in whispers. Back then, I didn’t understand and they explained things to me later. But what was it now? Why the silence. I hadn’t left the house for a long time. I wasn’t able to gather any information personally. My people – they hid the truth from me, in order to protect me from any abrupt emotion. Silence. All day long. And all through the night. And again. The epopee was over. Point de rȇveriers! Is life still worth living? The war forcibly pushed to create ruses, it created unintentionally grotesque situations. After the fall of the uprising, during an action devoted to saving precious monuments, a truck was stopped by a gendarme at the turnpike in the Wola district. Professor Stanisław Lorentz was in the truck, seated on some object wrapped in blankets. The gendarme yelled 'And what is this?' at him. 'Der Führer', replied the professor. The gendarme saluted, mumbling something like 'Ja, ja'. Indeed, in the twilight, the sculpture could easily pass for Hitler’s head. In reality it was a bust of Ludwik Solski sculpted by Alfons Karny, and a part of the Great Poles series.